Read about Finland, its cuisine, attractions and what it offers to its visitors on this page for a trip to make the best out of your time in the country. Get ready to meet one of the most fascinating (and to me, the most) Nordic countries ever: Finland. You may already have a general idea about how well the country carries out the educational policies or how successful it is at maintaining the human rights issues as Finland constantly finds its place among the top countries list. While keeping on reading the amazing facts about this country such as the state’s sending a box of baby stuff to couples who are becoming parents or ruling internet as a basic human right, for some reason Finland is considered to be a Scandinavian country. However, except for the historical bound between Sweden and Finland, there is no reason to consider Finland as a part of Scandinavia. Finnish, the official language along with Swedish has actually doesn't have a lot in common with Scandinavian languages as well. You may have heard about the one of a kind baths of Fin saunas, its delicious cuisine and how such a broad land is populated by only 5.5 million people. Well, when we add the forests that cover 73% of the country and 168.000 lakes, Finland’s being a dream land gets a bit more justification in our minds. The only deterrent in falling in love with Finland may be the weather that freezes even the tiniest bone in your body, however that’s something that can be sorted out with a couple of more socks or sweaters. 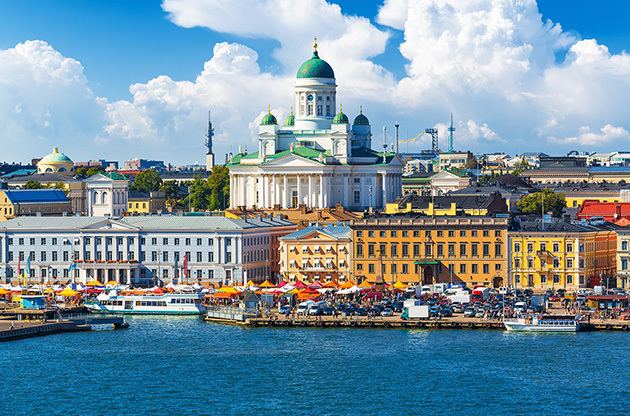 Finland is famous with its beautiful capital Helsinki of course, but in all of the 6 regions in the country there are other cities, even towns whose charm can compete with Helsinki’s. Turku, Jyväskylä and Tampere are among the major cities of the land and they keep attracting a lot of visitors, not only from Europe but also worldwide. And of course, Ivalo is chosen during the winter by those who would like to experience the magical Northern Lights. Finland, both with its one of a kind natural resources and the quality of life style is going to change your notion of ideal. At some point of your travel you’ll wish the time to go home would never come as there is literally no way of getting enough of the Finnish way of living and the country itself. As mentioned in the beginning, get ready to meet Finland, the utopian country. Finland is in Northern Europe, on the coast of Baltic Sea and neighboring with Sweden and Russia. Ministry for Foreign Affairs of Finland gives detailed information about the visa procedure of Finland. The cuisine of Finland, of course, is shaped by the harsh weather conditions which made the availability of fresh vegetables and fruits almost impossible. Therefore, the excessive usage of turnip, then potatoes didn’t come as a surprise back at those times. Although the ingredients are not varied, the Finnish Cuisine takes it uniqueness from the style of cooking. As the forests and lakes were the main source of survival in the past, long roasting times in ovens made the difference in the Finnish kitchen. Finnish Cuisine share a lot in common with Swedish one. From time to time, it is also possible to track the footsteps of Russian and German dishes as well. And when the effect of the modern time comes into scene, the Finnish cuisine also presents pizzas, pastas and burgers today. The typical Finnish dishes include Kaalikääryleet, which is cabbage rolls, Vendace, a type of salted fish, a sort of pea soup that is called Hernekeitto and Lihapullat, the Finnish meatballs. Maybe it is important to note that the regional dishes in Finland show more characteristics of the cuisine compared to the ones in major cities. In the beginning of 90’s, Finland was declared to be the most expensive country in the world. And since then unfortunately nothing much has changed. That’s to say, even souvenir shopping is not cheap in Finland and it is surely not the best country to buy a present for your cousin’s new born. However, there are a couple of traditional Finnish items that must be in your bag on the way home. Puukko knives might be the most dangerous traditional item across Europe but a good quality one is always a good idea to collect. In addition hand-woven Ryijy rugs are really famous worldwide. If you are lucky, you may find a good one for a considerable price. In big cities you may find shopping malls and special areas that are known as the main shopping areas. However don’t trust your being in a major city so much. In Finland, stores have strict working hours and most of them close at 6 o’clock in the evening. If you would like to do anything else than getting impressed by the epic view that surrounds you in Finland, you have a lot of options. Big cities of course have the museums and sights to see. You might as well try out the Finnish saunas to relax and erase ‘showering’ in your mind completely. Stylish bars and pubs, as well as clubs might also be your next stop in Finland. Trips to nearby Finnish towns or regions are also a good idea to discover more of Finland. Porvoo and Hämeenlinna are popular destinations within the country. Kemi is another region that is known with the icebreaker cruises. The last but not the least, if you are a winter traveler, seeing the Northern Lights in Saariselkä (winter sports center near Ivalo) is something you will never forget for the rest of your life. Baltic’s pearl, Finland has becoming a pioneer at hosting large scale international congresses, conferences, symposiums, fairs, exhibitions and trade shows. The capital Helsinki may seem to be the center for these large scale events however other big cities such as Espoo and Vantaa also play a major role in the country’s improving event scene. Finland hosts thousands of event attendees from all over the world every year.